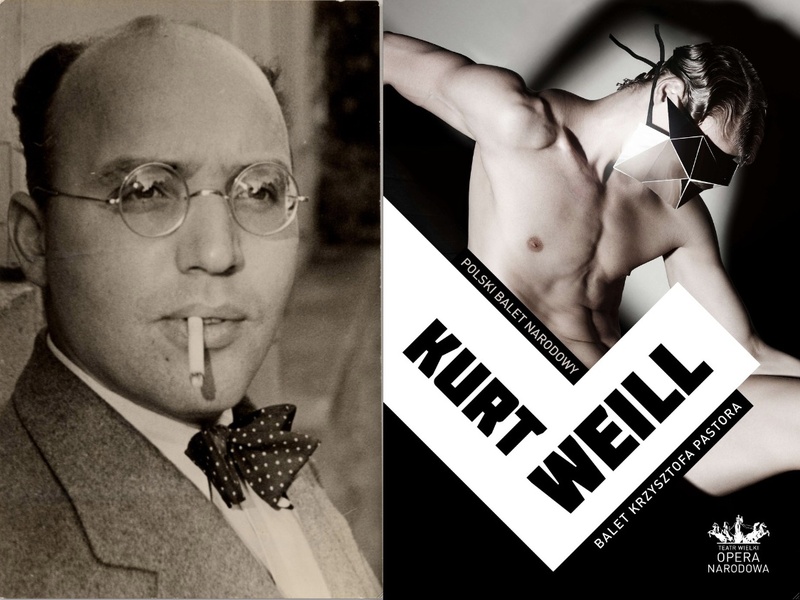 The son of a cantor, Kurt Weill was born in Dessau into a family that took in operatic performances as a main form of entertainment. When Weill was in his teens the director of the Dessau Hoftheater, Albert Bing, encouraged him in the study of music. Weill briefly studied composition with Engelbert Humperdinck and was already working professionally as a conductor when he attended composer Ferruccio Busoni's master classes in Berlin. Delighted to see the positive responses of an audience to his first collaboration with playwright Georg Kaiser, Der Protagonist (1926), he thereafter resolved to work toward accessibility in his music. In 1926 Weill married actress Lotte Lenya, whose reedy, quavering singing voice he called "the one I hear in my head when I am writing my songs." In 1927 Weill began his collaboration with leftist playwright and poet Bertolt Brecht; their first joint venture, Mahagonny-Songspiel (1927), launched the number "Alabama Song," which, to their surprise, became a minor pop hit in Europe. The next show, Die Dreigroschenoper (The Three-Penny Opera, 1928), was a monstrous success, in particular the song "Moritat" ("Mack the Knife"). Nonetheless, strain in their association was already being felt, and after the completion of their magnificent "school opera" Der Jasager (1930), the two parted company. Brecht and Weill were brought together once more in Paris to create Die Sieben Todsünden (The Seven Deadly Sins) in 1934. In the meantime, Weill collaborated with Caspar Neher on the opera Die Bürgschaft (1931) and Georg Kaiser again on Der Silbersee (1933), works that garnered the hostile attention of the then-emerging Nazi party. Liam Bonner sings "Lost in the Stars"
With the rise to power of Hitler, Weill and Lenya were forced to dissolve their union and flee Continental Europe. Weill found his way to New York in 1935; rejoining Lenya, Weill became a citizen and devoted himself to American democracy with a vengeance, preferring his name pronounced like "wile" rather than "vile." After a series of frustrating flops, Weill hit his stride with playwright Maxwell Anderson, producing his first hit, Knickerbocker Holiday (1938). Frank Sinatra sings "September Song"
In the dozen years left to him, Weill's stature on Broadway grew with a series of hit shows, including Lady in the Dark (1941), One Touch of Venus (1943), Love Life (1948), and Lost in the Stars (1949). Weill had ambitions to create what he regarded as "the first American folk opera"; the closest of his American works to reach that goal is Street Scene (1946), a sort of "urban folk opera" based on a play by Elmer Rice with lyrics by Langston Hughes. On April 3, 1950, Weill unexpectedly suffered a massive coronary and died in Lenya's arms. Weill's estate was valued at less than 1,000 dollars, and Lenya realized that his contribution to musical theater was likewise undervalued. She commissioned composer Marc Blitzstein to adapt an English-language version of Die Dreigroschenoper; it opened off-Broadway in 1954 and ran for three years, touching off a Weill revival that continues to this day. -1928 : The Threepenny Opera (German: Die Dreigroschenoper), Macheath (tenor or baritone), Jonathan Jeremiah Peachum, Tiger Brown and numerous smaller roles. - 1930 : Rise and Fall of the City of Mahagonny, Dreieinigkeitsmoses (Trinity Moses), Sparbüchsen Billy (Bank Account Billy) and Alaska Wolf Joe. - 1947 : Street Scene, Frank Maurrant, George Jones and numerous smaller roles. David Bowie sings "Moon of Alabama"
- Lost In The Stars, F Major, composed by Maxwell Anderson, Kurt Weill, from 'Lost In The Stars'. - Mack The Knife, C Major, composed by Marc Blitzstein, Kurt Weill, from 'The Threepenny Opera'. - September Song, C Major, composed by Maxwell Anderson, Kurt Weill, from 'Knickerbocker Holiday'. - This Is The Life, Eb Major, composed by Maxwell Anderson, Kurt Weill, from 'Love Life'. - Thousands Of Miles, C Major, composed by Maxwell Anderson, Kurt Weill, from 'Lost In The Stars'.